I love this quote I found on Week in Review. – tk(o). 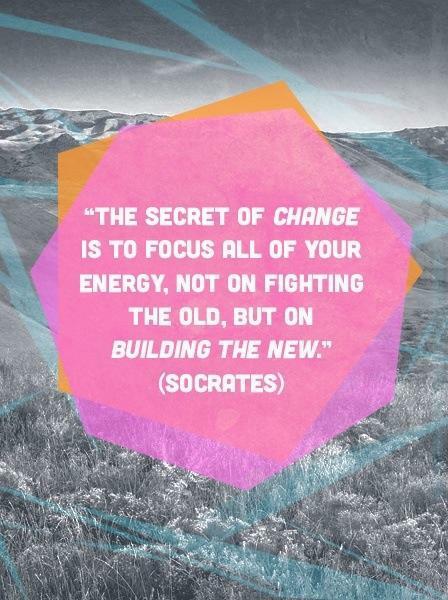 Now, I don’t know if Socrates actually said that or if it’s a misquote, but I truly need to remember this. Whenever I am feeling like I am fighting myself, I need to remember to BUILD. If I ADD good foods, there will be no room in my tummy for bad ones. If I ADD good habits, I won’t have time to waste doing things that harm me. If I ADD an exercise routine, then I won’t be a lazy lump sitting around. I don’t need to stop eating bad food, break bad habits or stop being a lazy lump, I need to BUILD a better me.